Okay, I know it's not for everyone. 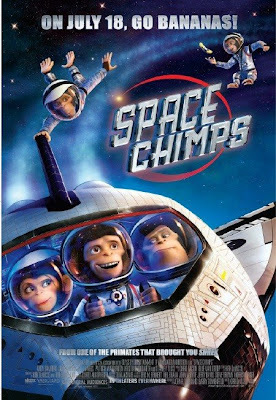 'Space Chimps' is meant for the young minds, whatever their physical age. Lady K and I were amused and that's what counts. Two stories in one movie. One is the growing up of Ham the Third, grandson of the last chimp in space. He is a circus performer and gets called up for the space program to locate a lost space probe. Ham 3 is a wee bit full of himself and juvenile in attitude. He meets the real space chimps, Luna, Titan and Comet, and gets a lesson in growing up and they get a lesson in letting their 'inner chimp' out. The other story is the planet where the space probe crash landed. The inhabitants are already being bullied by a tyrannical dude. Then the space probe crashes on his house and gives him more power to abuse the smaller beings. All of this with a lot of humor, fairly cool tunes and good voice characterizations by the likes of Jeff Daniels and Patrick Warburton. We'll get this on DVD when it comes out. Four beans for the sheeer grin factor!